Imagine that someone at the office says that God speaks to him. At first we may think that he is not really serious. If he persists, we may wonder if he is truly sane. Or, could he be simply mischievous, trying to get us all worked-up over nothing? Or, might he be mendacious, lying for personal gain? When Muhammad claimed that he is the Messenger of God his people were caught in the same quandary. They had to make a decision about him: if God really spoke to him they ought to listen to God’s message; and if God did not really speak to him, he had to be either mad or mendacious. For some people, it was easy to decide. They had known Muhammad personally for a long time. He was neither insane nor mendacious. On the contrary, they had recognized him for his wisdom and truthfulness. For others, it was not easy to decide, especially at first. Nor was it easy to ignore him. The message he said he was receiving from God questioned the validity of their tribal religions and their social customs. In terms of religion, the message, in a nutshell, was that their numerous idols were worthless, that there exists only One God who alone deserves to be worshiped; and that God will resurrect us after we die. In terms of social customs, the message defended the rights of the poor, the oppressed, the widows, orphans, and servants. The message condemned female infanticide, drunkenness, and lawlessness. According to the message, we must face God’s judgment for such social evils. 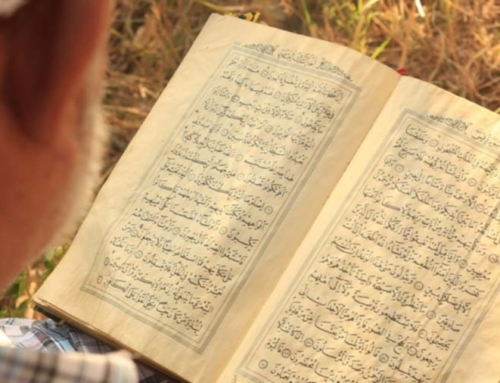 Did Muhammad write the Quran? At first glance it may seem that anyone can easily author a book and then claim that the book is God’s revelation to him. But, on further reflection, it is clear that making a false claim in this regard requires a certain type of character. Only a mendacious person can make such a claim. Besides, the Quran is a collection of 114 chapters which Muhammad recited a bit at a time over a period of twenty-three years. How does a man who was known to his contemporaries as a wise and honest man maintain a lie like this for such a long time? (This is) a Message sent down from the Lord of the Worlds. And if the messenger were to invent any sayings in Our name, We should certainly seize him by his right hand, And We should certainly then cut off the artery of his heart . . . (Quran 69:43-46). Or they may say, “He forged it.” Say, “Bring ye then ten suras forged, like unto it, and call (to your aid) whomsoever ye can, other than Allah!- If ye speak the truth! (Quran 11:14). To the surprise of many of Muhammad’s contemporaries, however, his message, despite the most severe opposition, soon became triumphant over all other competing religions in the region. Within a mere twenty-three years, Islam, the message of the Quran, became the dominant religion in the Arabian peninsula. Islam could have gone down in history as a mere fad, an idea invented by Muhammad but later found to be as unworthy as the idols he condemned. But it has survived today as one of the major world religions now placing within our own purview the original question that faced Muhammad’s contemporaries: What manner of man was he? Though not a Muslim, Michael Hart, in his book The 100: A Ranking of the Most Influential Persons in History, placed Muhammad as the most influential of the one hundred most influential persons. The Quran as we now have it in our hands, either in the original Arabic or in an English translation, is thus the body of the revelations received by Muhammad. In form God is the speaker, addressing Muhammad or the Muslims or people in general, and frequently using the ‘We’ of majesty. The earlier passages often contain commands to Muhammad. For Muslim tradition the Quran is thus the Word or Speech of God, and Muhammad himself must also have regarded it in this way. Moreover, he must have been perfectly sincere in this belief. . . . To carry on in the face of persecution and hostility would have been impossible for him unless he was fully persuaded that God had sent him; and the receiving of revelations was included in his divine mission. Only a profound belief in himself and his mission explains Muhammad’s readiness to endure hardship and persecution during the Meccan period when from a secular point of view there was no prospect of success. Watt’s confident attestation of Muhammad’s sincerity rules out for us the suggestion that Muhammad was mischievous or mendacious. What then remains of our analysis? We should, therefore, logically conclude that he was a messenger of God. A similar choice faces us today, and the logic remains the same. We may not have known much about Muhammad to be able to decide the question as to what manner of man was he. Or we may have ignored him for too long. We may have chosen to criticise him as a madman or a lying imposter. But the more we examine his life and his teachings the closer we get to the conclusion that he could not have been mad or lying, and therefore that he was truly a messenger of God. Nouman Ali Khan answers the frequently asked question: How do we know who is a true Prophet? How do we know that the book recited by Prophet is the speech of Allah? Why is the Prophet a human being? Watch this video for answers. This video is produced by 877-Why-Islam. For more information, please visit www.WhyIslam.org.